IDEAS ON YOUR TIES & POCKET SQUARE COMBINATIONS - PART 5. March 29, 2017 (Original post date). As spring is upon us, its time to look through your wardrobe and bring out your bright colours ties to wear and of course, pocket squares. Have any of you taken a fancy to the burnt orange hues? I have! 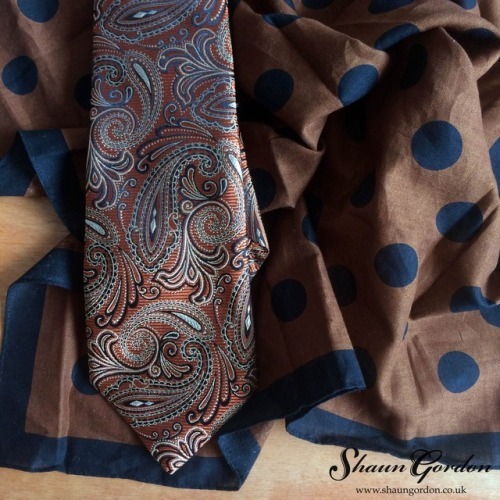 This is one of my favourite combinations because the orange colour of the tie and pocket square complement each other tonally while the black pattern links them together. What’s also interesting is the differences of material, such as the Montgomery tie is 100% silk and the United Arrow pocket square is 100% cotton. This creates a dynamic visual interest because the texture differences even though they are subtle. I hope this helps and inspires you to explore the many possibilities on your tie and pocket square styling. I would be honoured to hear how you match your pocket square with your ties. Please leave comments below, even if you disagree with what I have written or if you have any suggestions to add. If you missed the previous posts on this topic, then click here: Part 1 , Part 2, Part 3, or Part 4. For more information or to purchase the Montgomery tie, simply click here. Your posts on coordinating a tie and pocket square have provided valuable tips. I find it hard to get the right combination, and I don’t want it to appear that I’m “trying too hard.” I have an equally difficult time with coordinating striped or patterned shirts with ties. Perhaps I’m too afraid the shirt and tie will clash, so I often default to a white shirt. These posts and your Instagram feed have been invaluable resources for me. Keep up the great work, and I love your ties! Thank you very much for your kind words John :). There’s nothing inherently wrong with clashing colours and combos as long as it is done correctly. However it takes time to build up to the point of knowing when and how to Clashes patterns etc. It’s almost like saying know the rules first and then break them because by then you are confident to do so and you trust your instincts. Generally speaking, as long as there’s at least one colour that links everything together you should be fine. I hope this helps and have a wonderful day sir.